The Government of Newfoundland and Labrador refers to the provincial government of the province of Newfoundland and Labrador. It was established by the Newfoundland Act and its powers and structure are set out in the Constitution Act, 1867. This arrangement began with the 1949 Newfoundland Act, and continued an unbroken line of monarchical government extending back to the late 15th century. 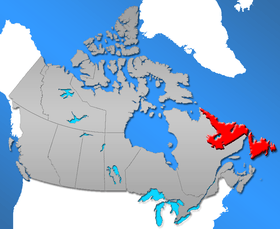 However, though Newfoundland and Labrador has a separate government headed by the Queen, as a province, Newfoundland and Labrador is not itself a kingdom. Government House in St. John's is used both as an official residence by the Lieutenant Governor, as well as the place where the sovereign and other members of the Canadian Royal Family will reside when in Newfoundland and Labrador. The mansion is owned by the sovereign in her capacity as Queen in Right of Newfoundland and Labrador, and not as a private individual; the house and other Crown property is held in trust for future rulers and cannot be sold by the monarch except by her Lieutenant Governor with the proper advice and consent from the Executive Council of Newfoundland and Labrador. Confederation Building, the seat of the Newfoundland and Labrador House of Assembly.